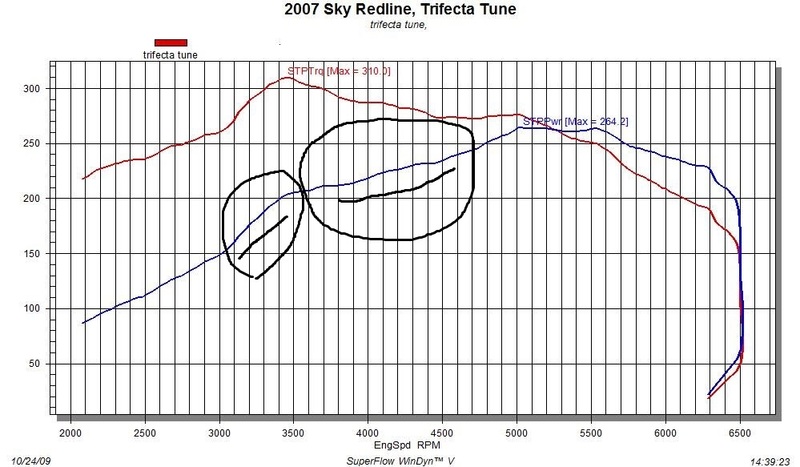 Pontiac Solstice Forum > Technical Solstice Discussion > Mods - Engine 2.0 Turbo > Any Dyno's Of Redlines or GXPs on Base Trifecta Tune with Solo HiFlow Downpipe? Any Dyno's Of Redlines or GXPs on Base Trifecta Tune with Solo HiFlow Downpipe? 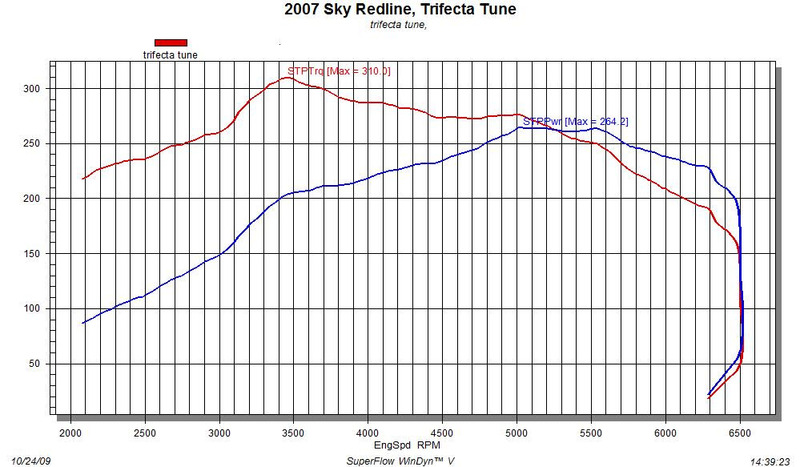 Vince told me way back when we were tuning my car that the best he had seen was about 286 whp. The Solo CAT should add around 10 whp to that (although many will claim more). Someone must have some actual dyno results to confirm. As I was looking through my old emails with him, I found an interesting comment on tuning the NA cars. He said that the gains with them were often better than customers expected because the stock tune has a PE mode that requires about a 5 second lag between flooring it and getting full enrichment. By eliminating that, he was seeing up to 20 ft-lbs improvement on those cars. So I did find a somewhat similar comparison on Skyroadster.com (which i'm quoting below). It's from Monadzback's dynos. 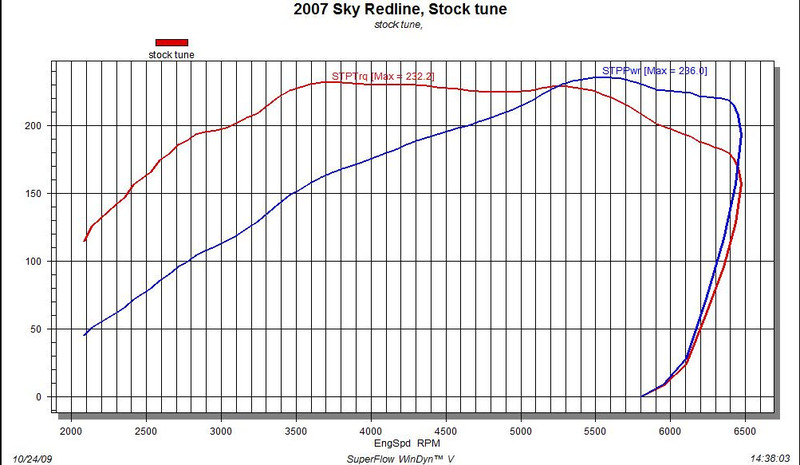 First dyno was trifecta on stock redline. Second dyno was a gutted cat, but on a custom Trifecta tune (so it would be a little different) but the stock tunes are definitely comparable. Thanks Matt. Very interesting as i'm going to get a dyno this spring done on my coupe as i do have the hiflo with DDM'S high end tune. This dyno stuff is a real learning curve for me as trying to understand it all. Last edited by easyryderca; 02-07-2019 at 11:01 AM. When comparing dynos. There are a few things to look at. The stock dynos (without the gutted cats) have obviously been smoothed a little more but the overall characteristics of the graphs (comparative shapes) of the before and after graphs are pretty similar. What most people do (but you shouldn't) is compare just the top numbers. What's more important are the changes to the shapes of the graphs before and after the peaks. 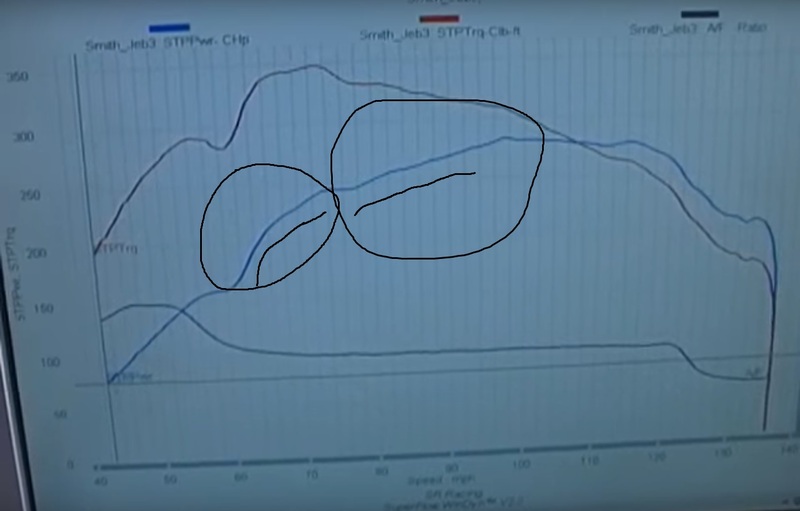 Just to observe....I've circled a few places on the two graphs and drawn the shapes their increases make. 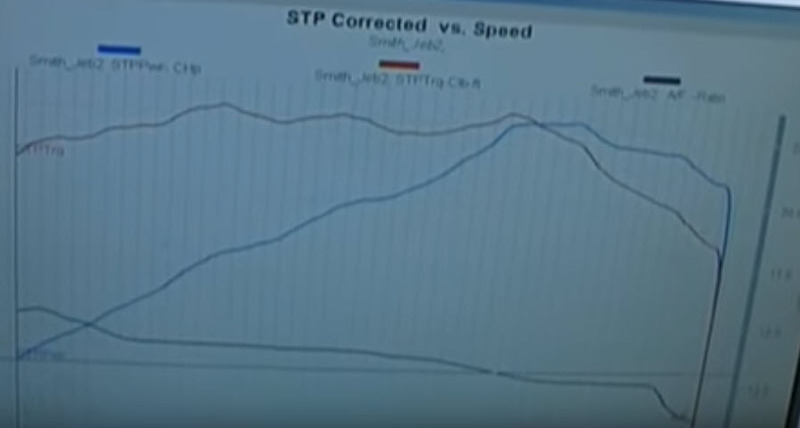 The second graph shows a more aggressive increase over the first one, which means you are getting much better performance throughout your rpm range and power band. That would be the one you want EVEN if the peak numbers are lower because you are only getting better performance at one single spot of the curve. Hopefully that makes sense.